Home / Art Fair Philippines / Art Fair Philippines 2013 / ayala land / February / Kai Restaurant / kenneth cobonpue / Makati / Make It Happen Make It Makati / samsung / The Link / The Straits Wine Company / Art Fair Philippines 2013 this February! Art Fair Philippines 2013 this February! Aside from celebrating the Love Month, February is also the month for art lovers to indulge into some masterpieces that are made by our own geniuses. And by the help of the City of Makati and Ayala Land's Make it Happen Make It Makati, a showcase of the country's best of the best contemporary artists will be on display for the Art Fair Philippines 2013. Twenty four invited galleries and art groups from the different parts of the country will be featured on this breakthrough exhibition sharing their rosters of carefully edited selection of works. 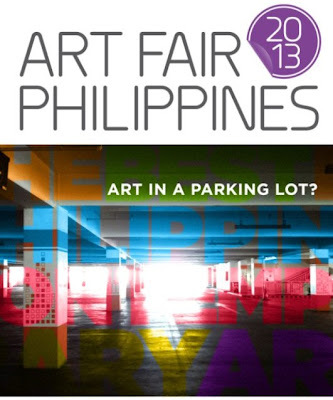 The Art Fair Philippines 2013 will take place in an alternative urban venue - The Link car park, which will be styled by design wonderer Kenneth Cobonpue. The said car park, which is on the Level 6 of The Link, is said to be transformed into a real art boutique that will have a pop-up café and VIP lounge in air-conditioned comfort provided by Samsung air conditioners. There will also be an all-day casual dining and cocktails in the early evening courtesy of Kai Restaurant and The Straits Wine Company. This car park is located between the Makati Shangri-La Hotel and the Landmark Department Store. Names familiar to followers of the Philippine art scene, stalwarts of regional art auctions, as well as promising newcomers will be sharing their best pieces that will add not just colors but pure art-excitement to this whole event. Art Fair Philippines 2013 is specially curated shows will be mounted by each gallery: CANVAS will work with six artists, including Elmer Borlongan, Emmanuel Garibay and Don Salubayba, on the theme "Looking for Juan in Basketball", while Tin-Aw Art Gallery will feature a solo show by Mark Justiniani. Other major galleries participating are Silverlens, The Drawing Room, Galleria Duemila, Blanc, Art Informal, Manila Contemporary, Finale Art Gallery, West Gallery, MO Space, Boston Gallery, Altro Mondo among others. "Asphalt", a rambling installation from sculptor Gabriel Barredo, is an intriguing, fantastical folly imbued with the amazing creative and mechanical genius of the artist. This promises to be a marvel to anyone, whether they are familiar with or new to Barredo's work. A surprise offering from auction superstar Ronald Ventura is in the works too. Art Fair Philippines 2013 is said to deliver a unique, multi-layered experience to anyone interested in Philippine contemporary art. And according to my little bird friend, visitors will be welcomed at a specially commissioned reception desk created entirely of iconic San Miguel Beer crates by artist Norberto “Peewee” Roldan, Jr.
Art Fair Philippines 2013 aims to be the art fair for the Philippines, so yes, let's see each other there! It'll be on February 7 to 10, 2013! For more information and a complete list of participants, you can visit www.artfairphilippines.com.